Agreements concluded in May of this year between the Belarusian High Tech Park and Uber, along with the opening of an R&D centre for the Israeli company Gett, demonstrate the growing success of the Belarusian IT industry. Dave Waiser, Gett’s CEO, compared Belarus to Israel in terms of its small domestic market for retail business, but big opportunities for IT export for worldwide use. Over the past decade, Belarusian IT services have grown by almost 50, with export reaching $900m – a number which is growing at a rate of 20 per cent and currently constitutes 12 per cent of Belarusian export. Out of the 1,000 IT companies in Belarus, only 24 belong to the state. The largest IT companies, which operate in Belarus’s most promising industry and do most of their business abroad, put continuous effort into ensuring the industry continues to grow. 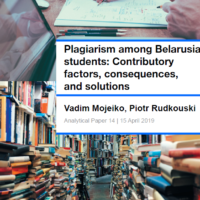 While the authorities support the increasing contribution of the IT sector to Belarus’s declining economy, it is Belarusian IT companies themselves which play the largest role in boosting IT education, expanding the sector’s size and regional reach, and cautiously influencing changes in legislation. 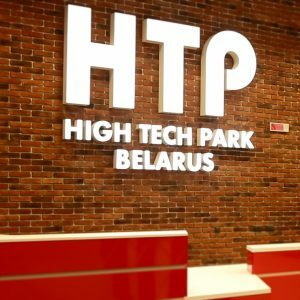 It’s been 12 years since High Tech Park opened in Minsk, after the president signed the decree ‘On High Tech Park’ in 2005. Before the park’s opening, Belarus’s IT export constituted $15.2 million. In 2009, HTP had already reached $121.5m worth of export. In 2016 it reached $820.6 million, expanding its activities into the fields of nanoelectronics, mechatronics, data transmission, and other areas. Currently, the park hosts 173 companies from 67 countries, producing 91% of its software for export and attracting $169m of foreign direct investment. Thanks to HTP, the export of Belarus’s IT services became the second most important contributing factor to the country’s current positive trade balance for foreign services. A few days ago, HTP opened an educational centre in a regional department in the city of Hrodna. The department implements and supports regional ICT projects, cooperates with local universities, and promotes employment in the IT sector. HTP has also opened IT academies in several locations in order to teach programming to school children. In this way, the park can enhance IT education while motivating students to specialise in ICT, consequently increasing the number of potential IT specialists for the growing sector countrywide. The number of foreign companies entering HTP is increasing thanks to tax benefits and a pool of inexpensive and highly qualified specialists; this creates a perfect environment for outsourcing. Four Companies with Belarusian roots (EPAM Systems, IBA Group, Intetics, and Itransition) are ranked among the world’s largest outsourcing companies in 2016 Global Outsourcing 100. Another ranking, SoftwareMag, includes EPAM, IBA and eight more HTP residents among the top 500 IT service providers. EPAM Systems is the largest Belarusian IT company, registered in the US with 25 branches around the world. Arkadz Dobkin, a Belarusian immigrant to the US, founded EPAM in 1993. Today, EPAM employs 22,000 people, including 8,000 in Belarus, where the company has branches in all regional centres. With revenue of over $1 billion and IPO at the New York Stock Exchange, EPAM is the fastest-growing IT company in Belarus and among the fastest in North America. Over the past six months alone, the Belarusian branch of EPAM increased its staff by more than a third. EPAM invests millions of dollars into real estate for Belarusian programmers, finances university training programmes, and runs start-up initiatives. Moreover, the company is listed among the winners of the ‘Best Exporters of 2016’ for its leading position in Belarus’s IT services export. However, EPAM’s overall revenue structure shows that North America takes the largest share (59.2 per cent), while CIS receives 14 times less (4.2 per cent), and this gap is widening. Hence, most of EPAM’s revenue falls outside Belarus, the country with the most employees. IBA Group, the third largest IT exporter and second biggest supplier to Belarusian market, is another major Belarusian outsourcing company. IBA owes its creation to the US company IBM, which established a joint venture with the Minsk Research Institute of Computers in the early 1990s. Today IBA is headquartered in Prague, while the Minsk-based office remains the key to the company. IBA has developed several projects for the Belarusian market, including an e-tax system for the Ministry of Taxes and Duties, a ticket system for public transportation, and budgeting systems for banks. In August 2016, the media claimed that Belarusian police had detained IBA’s top managers. While IBA CEO Siarhiej Liaŭciejeŭ denied this information, he confirmed certain claims by national law enforcement agencies. Nonetheless, IBA, EPAM, and other top IT companies, such as Itransition, ISsoft Solutions, and iTechArt, remain among the top Belarusian IT service providers to this day. While the Belarusian IT industry largely focuses on services, product development continues to be the most profitable sector. Wargaming, founded in Minsk in 1998, is a primary example. Last week, the world’s fifth most popular PC gaming company held its 2017 Grand Finals in Moscow, gathering 12 teams to compete for a $300,000 prize. Officially registered in Cyprus, Wargaming garners international recognition for its game World of Tanks, played by 110 million users. The game turned the company into an international corporation. Wargaming’s CEO Viktar Kisly became the first gaming industry billionaire from the CIS included in the Bloomberg index, which valued Wargaming’s business at $1.5 billion. However, since World of Tanks, no other game has had similar success. Stagnation of the business could have influenced the decision of co-founder Ivan Michnievič to leave Wargaming in 2014. While the Minsk-based Game Stream Studio continues developing new projects, recent games such as World of Warplanes and World of Warships have failed to take off. Other fresher examples of Belarus’s IT development is the company Banuba Development, registered in Hong-Kong with a development centre in Minsk. Backed by $5m of funding from the Gutseriev family’s Larnabel Ventures and Viktor Prokopenya’s VP Capital, the team of 45 Belarusian programmers are currently developing augmented-reality-enabled mobile apps. Already boasting 11 US patents, Banuba expects to present its first application this year. During Lukashenka’s visit to several IT companies, the president made clear that the state has given a green light to the development of the IT industry. 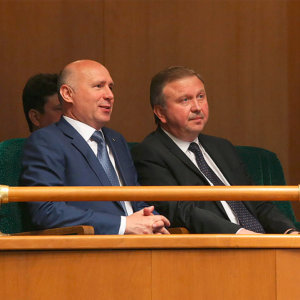 Lukashenka praised the achievements of Belarusian IT companies, promising to expand state support for new projects. The fact that Belarus already has EPAM and InterActiveCorp (IAC), which owns the HTP-registered mobile apps developer Apalon, shows that the right steps are being taken towards involving large corporations in Belarus’s IT sector. Nevertheless, further revenue growth requires a new legal system to support the IT product model and attract more public IT companies with traded shares on stock exchanges. While Belarusian and Russia-oriented exports continue to shrink, the West-oriented IT industry is growing by leaps and bounds. The government supports Belarus’s high-tech achievements by asking for its 5 per cent share in GDP, while IT businessmen carefully push for reforms in economic legislation. As long as the interests of IT business and the government in making Belarusian economy more innovative coincide, HTP residents can expect production and revenue growth, as well as more IT corporations coming.